At least 21 containers fell into the sea after two ships collided at the Karachi port in Pakistan on Monday evening. Investigation revealed that the pilots of Karachi Port Trust, who took charge of the vessels, are responsible for this incident. 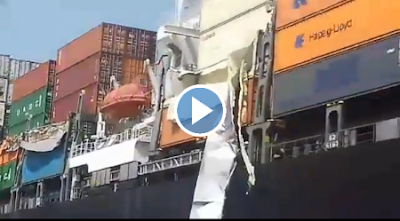 The shocking video shows German-based company Hapag-Lloyd's ship leaving the port and scraping against an anchored vessel fastened beside it, sending loaded containers on both the ships crashing into the sea.